All Client/Trainer relationships are strictly confidential. Linda S. Jassmond, LLC does not reveal the identity of any clients without their express permission. The testimonials below are from clients who have agreed to tell their stories. Before I met Linda I felt my lifestyle was out of control. I dreaded the holidays because it meant gaining 3-5 lbs or more and feeling terrible about myself in January. Sitting down to dinner and eating until I was stuffed to the point where I was uncomfortable, only to wait an hour or so and hit the dessert table. And then there was the "I'm going to get back in shape" mode that I would get into in January that started with the starvation dieting that led to headaches and grumpiness and very little progress on the scale. I felt helpless. 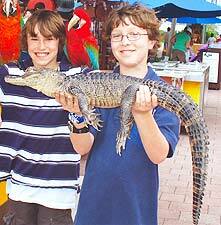 I tried weight watchers, slim fast, Atkins, you name it. Then I met Linda and she taught me how to change my habits and take control of my lifestyle. Now I am 100% in control, I eat well, I exercise and I feel great! I was always worried about going back to my old habits whenever I tried some new diet and that's generally what happened because diets are temporary. Linda taught me to change my habits and now I have my life back. I feel as if I have stolen someone's body and it feels terrific. 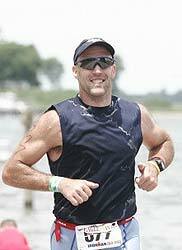 I am competing in my third Ironman and my 5th 1/2 Ironman triathlon this year. I could not have gotten here without Linda. If you have the desire, she will show you the way. It's all good! 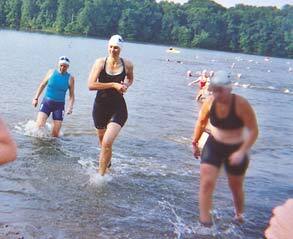 Note: An Ironman Event is swim 2.4 miles, bike 112 miles then run a marathon–26.2 miles. 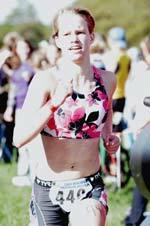 A Half Ironman is: swim 1.2 miles, bike 56 miles then run a half marathon–13.1 miles. Linda chronicles client Wills Martin in this 25-page color picture book for children. I think working out with Linda is a fun way to be active. It is good for people of all ages. Before I met Linda, I didn't like sports. Now, my soccer and baseball skills have improved greatly. Also, I can spiral a football. Thanks so much to Linda! I am still working out with Linda and it's just as much fun as it was when I first started. We do many fun things and sometimes I let her win at ping-pong! I play tennis and my tennis game has improved greatly because of my work with Linda. I feel much more confident thanks to her. I fought with myself a lot this past year while training. I asked myself why I was doing this? Today, I figured it out. 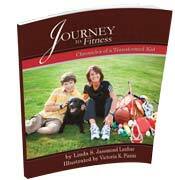 Linda chronicles client Jackie Stenta for two years through her fascinating journey. Simply put, Linda changed my life. She made impossible things not only possible but now part of my daily life. I will be forever grateful for the dedication, enthusiasm, support, creativity, spirit, knowledge and complete commitment Linda brings to her job everyday. Linda chronicles client Suzanne Jackson for six months with amazing end results! I started working with Linda in 2008, six weeks after having my second son. At the time I was determined to lose the baby weight I had gained during pregnancy. That goal was achieved and exceeded in just six months (see photos below). Click here to read the Lisa's blog entries on her new journey. What an unbelievable transformation in just 7 months! When I first started training with Linda in February of 2008 I had a six week old baby, a two year old, and I was carrying around 20 extra pounds. I was determined to lose the baby weight, plus some. In just 7 months, Linda taught me how to make healthy food choices, how to mix up my exercise routine, and encouraged me through the plateaus. She spent time teaching me how to exercise correctly so that my body remains healthy for life and injury free. 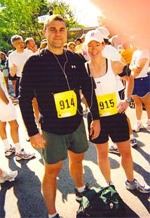 Linda also encouraged me to run my first 5k in May. I never thought I would see my wedding weight again, but we did it, and I feel amazing! I first meet Linda about a year after the birth of my third daughter, Ella, and I was trying to get back on the exercising bandwagon to lose the baby weight and get in shape. She was so kind, supportive and encouraging, I knew that with her help I would be able to finally shush that voice in my head that is so wonderful at making excuses for not exercising. Linda helped me identify and write down my goals so I would have a visual reminder. We also created exercise routines that I could do at home — we even incorporated my youngest daughter into some routines in place of weights. Not only did Linda help me create an exercise plan that fit into my family routine, she helped me focus on my diet and snacking so I could make healthier choices. 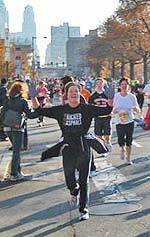 I feel so much stronger and healthier and I challenged my husband to a 5k run! As a result of that 5k challenge, I learned that I really enjoyed running. I am not fast, but I get out there and run. With Linda’s gentle urging I decided to try some more races. In addition to another 5k, I ran a 10k trail run, the 10 mile Broad Street Run, completed my first Sprint Triathlon and I am now training for the Hershey Half Marathon in October. These are all things I never dreamed that I would be doing. 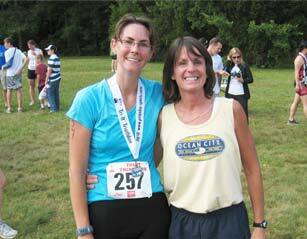 Linda always had the confidence in my ability to complete the races I entered, and I now know that I can do it. It’s not always easy with three young children at home, but when you really want to do something you find a way to make it work. I am confident that I will continue with my journey and look forward to where the road leads. Ella: YUMMY! I love eating veggie burgers for lunch! 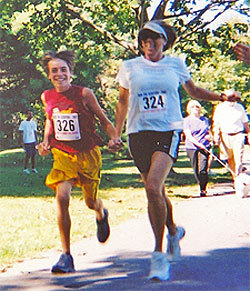 Me running: Never thought that I would be running in a 5k race, but with Linda’s help I found the confidence to try. 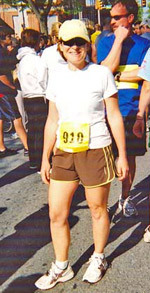 Me at the finish: Just finished my first 5k race. Slow and steady finishes the race. I am looking forward to my next 5k. 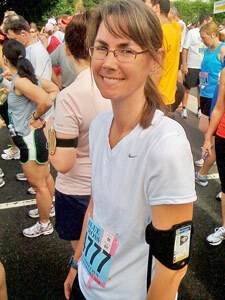 <<< Getting ready to run the Broad Street 10 mile race, May 2010. 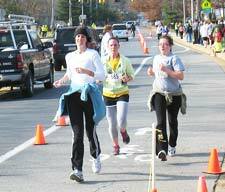 Was this your first marathon? This was my first, and last marathon. 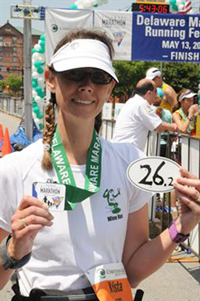 I celebrated Mother's day by running in the Delaware Marathon in Wilmington. How did you feel during and after it? I felt really good at the start of the race, kept the pace reasonable and steady. I picked up a running partner around mile 5 and we ran together for about 5 miles, which helped the distance and time pass. After encountering my cheering squad around mile 14 I felt pumped, but also realized just how hard the second half of the race was going to be. The hills started to beat me down and by mile 22 I was reduced to tears, but still moving. I was able to pull it together by mile 24 and finished with a smile on my face. 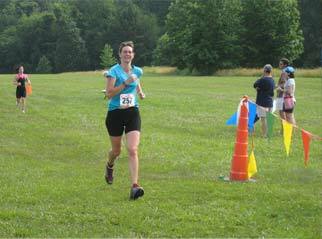 The first thought that crossed my mind after the joy of finishing the race was, "That was a stupid idea." When I decided to work with Linda, I expected to lose weight and tone up, but something else happened, something wonderful. Linda starts each session with a list of questions strategically designed to help you find your own path. Mine led us outdoors and Linda was right there no matter what the weather! Walking, running, climbing the hill, hitting golf balls, soccer, badminton, playing catch . . . anything we could do outside. 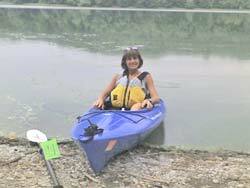 We hiked through the White Clay Preserve and kayaked the Octoraro Reservoir. 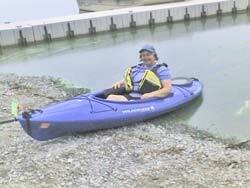 Linda had never tried kayaking, and I was excited to be the “trainer” that day. We had a great time! Before working with Linda, I was borderline diabetic. It runs in my family. Today I am not. And I am so grateful! Shortly after my 39th birthday, I met Linda Jassmond. At that time, I was well aware of my decreasing strength, stamina, and general well-being; and my increasing weight. While I knew that I would benefit from a regular work out schedule, I lacked the initiative and interest to motivate myself. 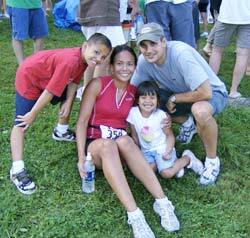 As a working mother with 2 very active kids, excuses were much easier than working out! I didn't have time in my busy schedule for preparing healthy meals and visits to the gym. 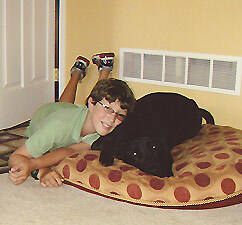 When Linda first arrived at my home, she was filled with enthusiasm and energy that I immediately envied. She had a maturity and breadth of experience that gave me confidence in her approach to working with me. Ten months later, I feel better than I have in years. As a matter of fact, for the first time in my life, I am looking forward to entering a bike race. Linda's approach works because she takes the time to get to know you personally as a client. Together you set goals not only for fitness, but for lifestyle. Linda is good at keeping you focused even through the day-to-day challenges of life. She is very intuitive and tailors your program to where you are at on any given day. I am grateful for the positive changes that Linda has brought to my life and I look forward to continuing my "journey" with her. 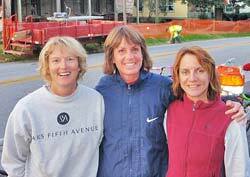 Annie said, "The most memorable moment was when Janet jumped out of the canoe to rescue her paddle!" I have been a dance teacher all my life, mainly dealing with children. When we moved to Pennsylvania two years ago, I decided I wanted to work with adults, teaching group exercise. It was a decision which was two fold — I needed some adult interaction and it would help me lose the extra 15 pounds I had somehow put on over the past few years. Since I have been working with Linda, I can honestly say that I look forward to it! Linda helped me to understand if you can't get rid of all the "junk" we needlessly deal with and start to think of ourselves more as number one, none of the other goals you may have will materialize. I learned to feel happy with what I have accomplished thus far, because it is my time, my workouts and my life! Oh and by the way, the 15 pounds are gone. 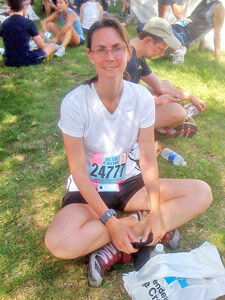 Click here for more about Leslie and her journey to an April 2010 triathlon. Sustainable.....that is the best word I can use to describe Linda's techniques. Anybody can go on a crash diet or exercise for a few weeks but at the end of the day a sustainable lifestyle change is the key to health and happiness. Linda excels at helping individuals achieve this. I have always had a difficult time with my weight. The only way I can keep my weight under control is to eat light and EXERCISE! I was at a point where I really needed help with selecting an exercise program that I could do safely and long term. My teenage daughter also needed to build endurance for the high school tennis team. So I met with Linda to see how she could help us. What I really like about Linda is her positive attitude and her ability to select a program that is specific for where we are and our needs. She didn’t ask me to start off by exercising an hour a day—she gave me very realistic goals that I felt I could reach, making it very doable. She is always there for us—supporting us and celebrating in our successes. Working with Linda has helped me become healthier and happier with myself. I have learned to recognize and manage some of the stresses that caused me to overeat in the past. Linda is fun and motivating and she is great at incorporating healthy eating and exercise into my "real" life so that changes have been sustainable. When I first started working with Linda, she told me that it was her job to keep me motivated. Wow, did she motivate me! She was always supportive, encouraging and upbeat. She pushed me, but I always felt so very good after spending time with her. She put together a fitness program that will stay with me forever. And she provided education on good nutritional habits. I am so grateful to Linda. She is the BEST! 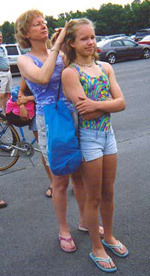 Laura's mom, Amy, prepares her daughter's hair for her first triathlon, in June 2007, before putting on mandatory bathing cap. 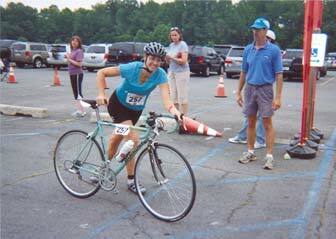 Laura S. was 13 when she competed in her second triathlon August 2007. She won first place for her age group! I am so grateful for meeting Linda. Her approach to health and wellness was the piece of the puzzle that I had been missing. Linda does not lay down a list of do's and don'ts, rather she guides you to better health and fitness, working within your own limitations and abilities. She helps incorporate health and fitness into your life without creating stress or burden. I highly recommend Linda! Linda has been outstanding to work with. From the onset, she assessed my needs and constructed a daily program for me, including one that met my extensive travel schedule and could be done anywhere, including hotel rooms! Most importantly she is cheerful and a powerful motivator. Working with her makes training and fitness a pleasure. I have worked out at home with video tapes for years and not seeing results. After working out with Linda, she has taught me the importance of proper form in all areas, and most importantly how to "punch up” the workouts. I feel the results from working out with Linda! Linda is patient, supportive, and always makes the sessions fun. I laughed as much as I sweated. She is results-oriented but with a person-centered approach. What could be better? <<< Carla (the batter) learned to hit hard balls both right and left handed. 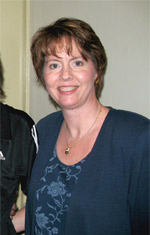 Pitcher is Linda Jassmond, Trainer. Sometimes people use age as an excuse, but not Carla, who is over 50. She was a trooper to be out there swinging a bat in some very hot and humid weather.